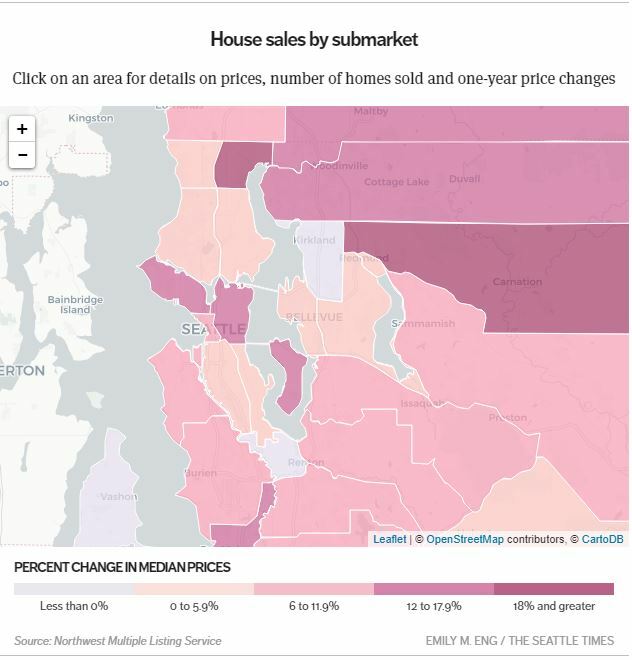 According to a Seattle Times article, home prices around the Seattle area are starting to drop as the market begins to show signs of a cool down. It is said the average home price across King County fell $30,000 in August compared to the previous month and recent data shows there has been a steady decline over a 3-month period. There has also been a slight decline in home prices countrywide, making the average price of a single-family home $57,000 cheaper since May. However, the change in prices around the Seattle area is more noticeable, which is good news for buyers. Home prices averaged $760,000 last month, which was a decrease of $45,000 from the previous month and $70,000 in three months. Even more good news for homebuyers is that there has been a 66% increase in the number of homes listed for sale compared to last year countrywide. The growing inventory has been a big trend over the past several months and it’s reported that the market has returned to 2014 inventory levels, wiping out four years of declines. The Seattle area has also seen an enormous jump in inventory where single-family homes shot up 86% and condo inventory skyrocketed 161% from last year. This surge in inventory is in large part due to homes sitting unsold for longer periods of time, which is pressuring sellers to decrease their list price – a radical change from earlier this year. There is generally a trend of price drops through the fall and winter months every year and if that trend does repeat itself, the region will be in for more price reductions over the next few months. According to Zillow, the Seattle market has faced more price reductions than any other metro area around the country. Furthermore, Washington State has been recently dethroned of the ‘fastest rising home prices’ title. The state has held this title for 18 months, with Seattle outpacing all metro areas nationwide for nearly 2 years. If you are a home buyer, contact our team of buyer specialists to learn more about how we can help you take advantage of this cooling Seattle market!